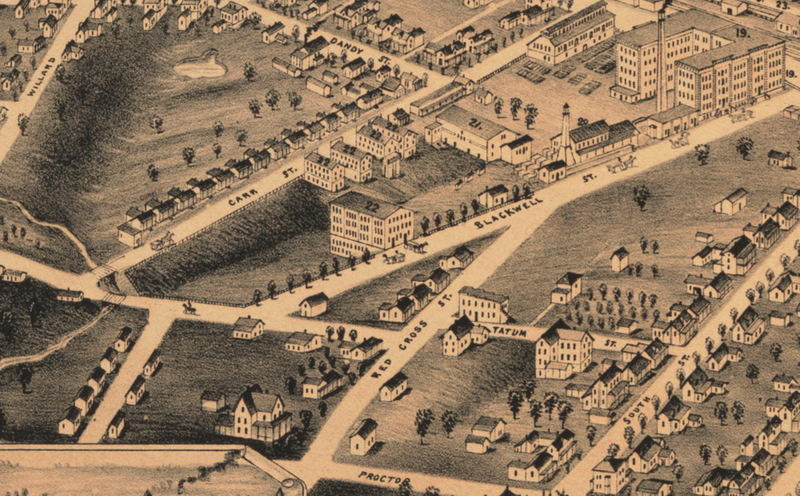 Looking northwest across the area around Blackwell's Durham Tobacco Co., 1891. I'd like to know how the short diagonal street extending southeast from Blackwell St. got the name "Red Cross Street", but I haven't found an explanation that suffices, other than the notion that the American Red Cross was nascent at the time these streets were being plotted. It appears that the street was lined primarily with small worker housing, likely for employees of Blackwell's Durham Tobacco Co., at the upper right portion of the drawing. McMannen St. and South St., further east, were developed with larger housing. Jean Anderson also notes that a "prize house on Red Cross St." was the second location of the first graded school for African-American children, after the Primitive Baptist Church and before construction of a permanent school, the Whitted School, at Ramsey and Proctor Sts. Located at 107 Red Cross St. "at the corner of Tatum Alley," the school was presided over by principal James Whitted. By the early 20th century, the area just to the east of the American Tobacco Company had significantly filled in with modest housing. 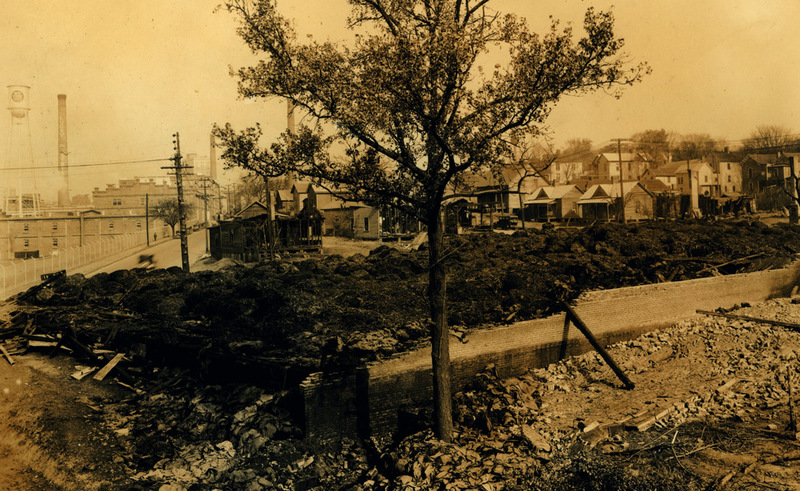 The picture below shows the area from near Proctor St. around 1930. Although the picture is unlabeled and undated, it appears that a tobacco warehouse had burned in the foreground. Looking north from Proctor St. Blackwell St. is to the left, and Matthews cuts diagonally from the left background to the right foreground, approximately 1930. 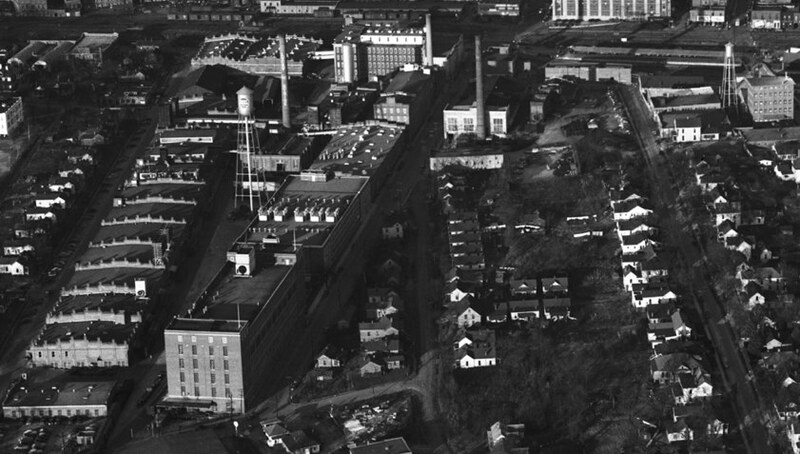 This aerial view from the 1950s gives a clear picture of the street extending to the southeast from its origin on Blackwell just to the south of the Durham Ice Plant / Light and Power plant. By 1968, these houses had been torn down by the city using Federal urban renewal funds. 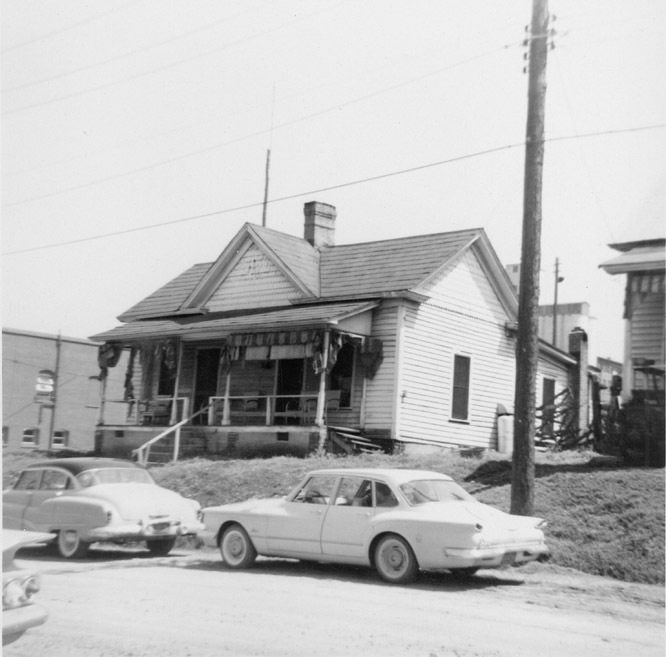 Matthews St. was closed, and became part of a large parking lot for the American Tobacco Company. I've told the story of the development of the Durham Bulls Athletic Park previously - the failure of the bond vote, and the decision of the city council to fund the construction of a new park despite that vote - in an effort to retain the Bulls in Durham. While the area to the west of the American Tobacco complex had initially been considered, the council settled on the unused parking lot of the American Tobacco Company. The ballpark was completed in 1995. It's a bit hard to show the former location of Matthews St. now, but I'd say that it would have stretched between the northwest corner of the stadium to the southeast across the grandstand.